While the S&P 500 has been dithering ahead of this week’s Federal Reserve meeting, Tesla Motors (TSLA) has been charging up. 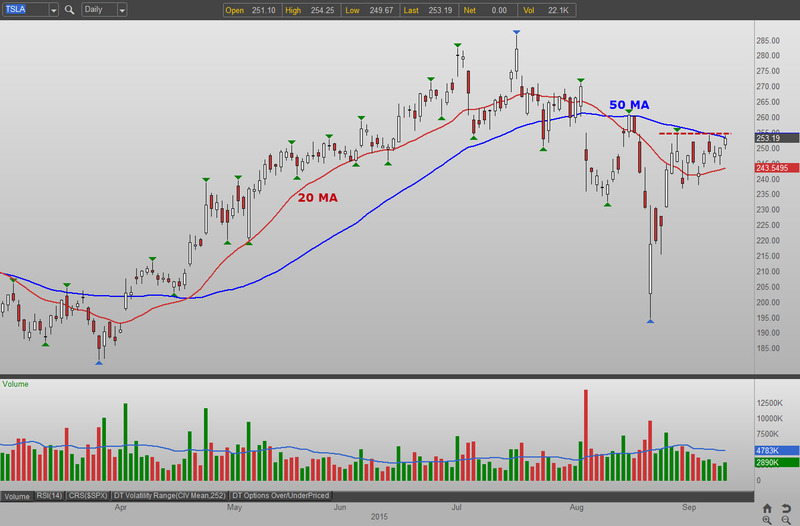 TSLA stock has weathered the recent downturn with relative ease and remains a stone’s throw from all-time highs. Should the Fed deliver the goods on Thursday, Tesla Motors could be one of the leading stocks amid any type of post-announcement euphoria. The price action during the market’s recent chop-fest has been quite constructive. Dips have been bought in TSLA with increased aggression, generating a handful of higher lows. Attempts at breaking above resistance in the $255 are becoming multiplying, and I suspect a successful breakout bid is imminent. Provided, of course, the Fed doesn’t throw us a curve ball this week. 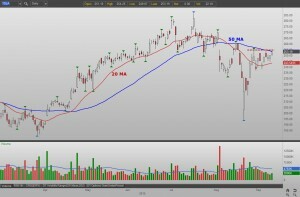 A successful breach of $255 will also vault TSLA stock back above the 50-day moving average, landing it soundly in bullish territory. If Tesla’s stock price can revisit its all-time highs near $290, we’re looking at $45, or 17%, of potential upside here. Given its lofty share price, TSLA options carry a hefty premium. Rather than swinging for the fence with long calls, try a call vertical spread instead. By both buying and selling options we can drastically cut the cost thereby controlling the risk in the position. Buy the Dec $255/$275 TSLA call spread for $8.45. The position consists of buying to open the Dec $255 call while selling to open the Dec $275 call for a net debit of $8.45 or better. The max risk is limited to the initial debit and will be forfeited if Tesla’s stock price sits below $255 at December expiration. The max reward is limited, yet substantial. To calculate the potential windfall, simply take the distance between strike prices ($20) minus the net debit ($8.45). The $11.55 potential profit will be captured if TSLA stock can rally above $275 by expiration and represents a desirable 136% return. By using December options, we give Tesla stock ample time to travel above the higher strike price into the max profit zone. Article printed from InvestorPlace Media, https://investorplace.com/2015/09/tsla-stock-jolt-looming/.